Are you looking for a show-stopping dessert? Something light and fresh? Look no further. These individual berry charlottes fit the bill. I have always, always wanted to make a charlotte. They are so beautiful and seemingly complex. 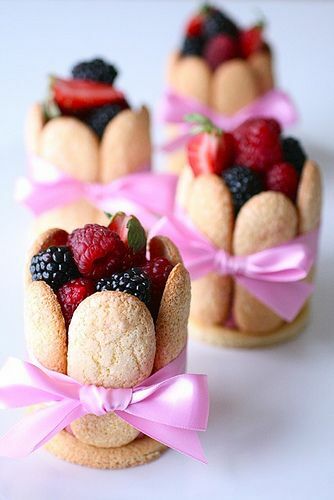 A dessert filled with mousse, topped with fresh berries and tied with a bow is right up my alley. Over a year ago I purchased a regular charlotte mold as well as individual ring molds with this goal in mind. What took me so long? For one thing, I’ve never been extremely fond of lady fingers. Up to this point the only kind I had tried were store bought, and those are nothing to write home about. Mostly, I had just built these up in my head so much that I didn’t think the real life result would live up to my idea of them.